Richard Perso, being an only child, always had to make up for his isolation by creating the same amount of mess as 3 kids. It was only a natural progression that led him to making as much noise as a 3-piece band. He doesn’t seem to have enough arms, legs or lungs to pull off such a physically demanding performance but that doesn’t stop him from playing 3 didgeridoos, driving a weapons cache of overdriven acoustic guitars and somehow managing to replace the roll of a drummer with little more than his 2 feet. It is fair to say that Richard Perso is living the dream. He played his first festival at 15, won a string of competitions and awards at the age of 16, played at the Adelaide International Guitar Festival and National Folk Festival by 17. 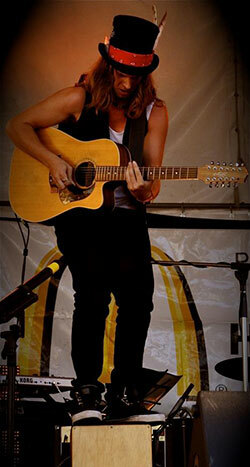 At 18 he has added Woodford Folk Festival and New York performances, a further 16 festivals 2009, as well as recording his Debut album in New York. By 19 he added a tour through Canada and East Coast USA He continues to blaze a trail through Australia’s vibrant festival circuit and live music scene. Have now played 160 festivals at the tender age of just 24, Perso has an enviable record brought about by his unique sound. Combining the one of the worlds oldest instruments, the didgeridoo with a diverse range of influences to develop a individual repertoire unmatched in today’s scene. Didgeridoos, acoustic guitars combining electric overdrive, kick drum tambourine and vocals to rumble the stage with influences covering folk, blues, roots and right through to rock it is a case of hang on for the ride where ever it may take you. 2013 was Perso’s biggest year yet with a new album fresh off the press titled ‘Dreams vs Reality’ and a mammoth tour schedule to launch all over Australia and a and 2 tours including a 6 week stint through some of Canada’s biggest music festivals covering Calgary Blues, Salmon Arm Blues and Roots, Stanfest and the biggest of them all at Ottawa Blues fest just prior to BB King in one of last shows. The one man excitement machine, Richard Perso will continue to develop his delivery blending multiple genres fused into a folky rocking roots and blues. A third album is on progression – his hottest music yet.